I was just a fledgling angler in my early 20s. Just out of college and working for a certified public accounting (CPA) firm to achieve my Nevada license, my audit practice supervisor was Bill “Bergie” Bergan. 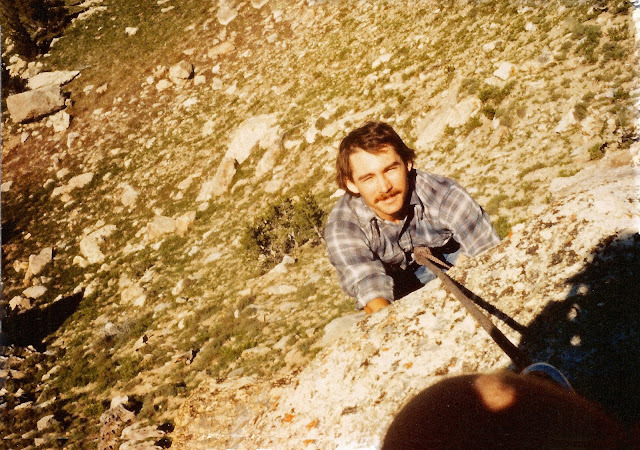 Bill was a weekend climber, and we somehow agreed to exchange hobbies with each other (see Early Climbing / Mountaineering Adventures for the details of that story). 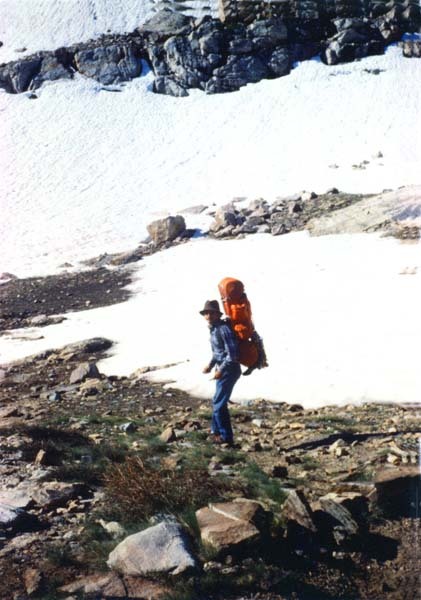 In the spring of 1979 we planned a Ruby Mountain backpack trip as a combination climbing/fishing adventure. 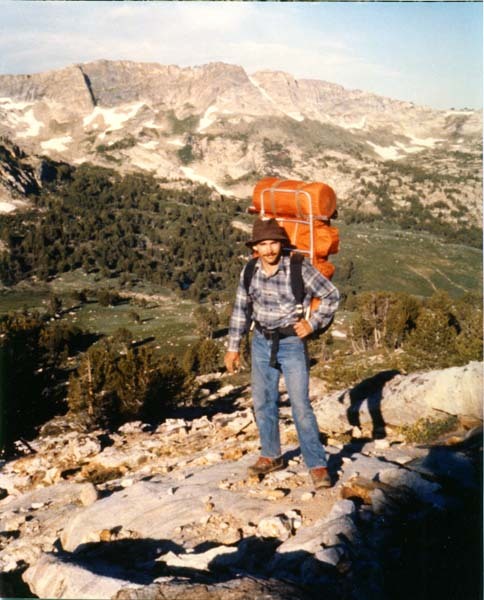 Neither of us had ever been to the Rubies, but had seen many pictures of the peaks and alpine lakes that gave rise to its nickname, “Alps of Nevada.” It remains one of the most beautiful places I have ever visited. In the 1970s it was a well kept secret. The nearby city of Elko had about 7,000 residents in 1970... and the 2018 count is over 20,400. By comparison, the Las Vegas metropolitan service area grew from about 300,000 in 1970 to about 2,300,000 today. Those remarkable 48-year average annual growth rates (1.8% and 4.5% annually, respectively) explain why the Rubies have significantly more attention from today's Nevada outdoor enthusiasts. Still, it remains an awesome place of adventure. 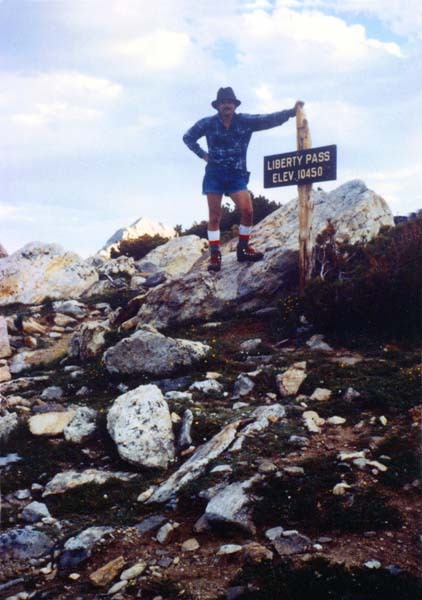 Looking south up at Liberty Pass, assessing the task at hand. 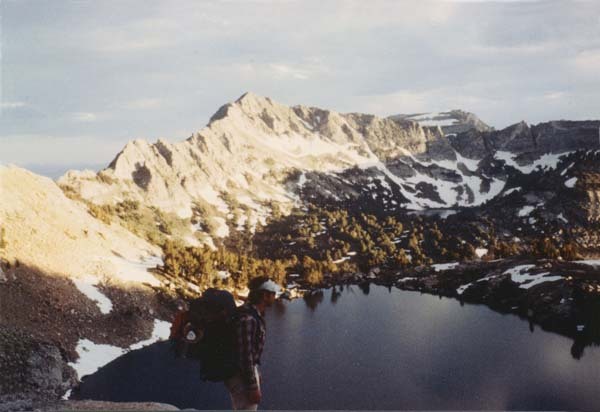 My brother Neal had backpacked the Rubies with his girlfriend, and he suggested we trek to Favre Lake, a 14-acre alpine lake nestled in the prettiest part of the mountain range at 9,500 feet elevation. 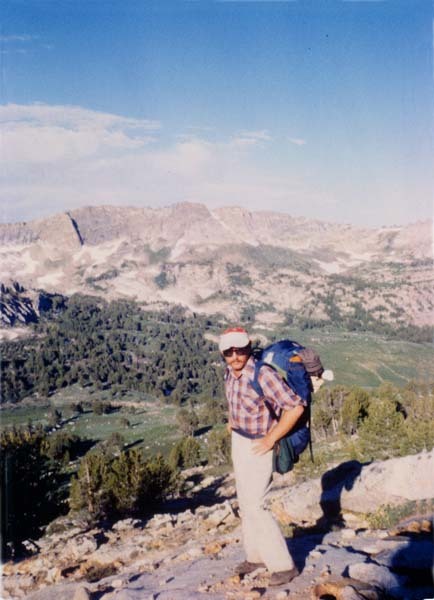 The trail starts in Lamoille Canyon at 8,800 feet elevation, rises to 10,450 feet at Liberty Pass, and then descends down to Favre Lake, a 3.8-mile one-way trip. Along the trail we passed the Dollar Lakes, Lamoille Lake, and Liberty Lake. The Dollar Lakes freeze solid in the winter due to their shallow depth, but the other three support abundant populations of brook trout. 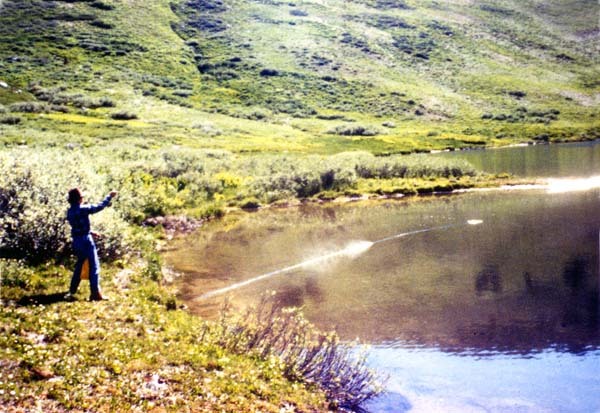 Nevada Wildlife documents say that Hidden Lake, located north of Lamoille Canyon next to Robinson Lake, once had golden trout back in the 1960s. Lamoille Lake drains north, creating Lamoille Creek which flows through the glacier-carved U-shaped Lamoille Canyon eventually exiting to the west and joining the Humboldt River's south fork. 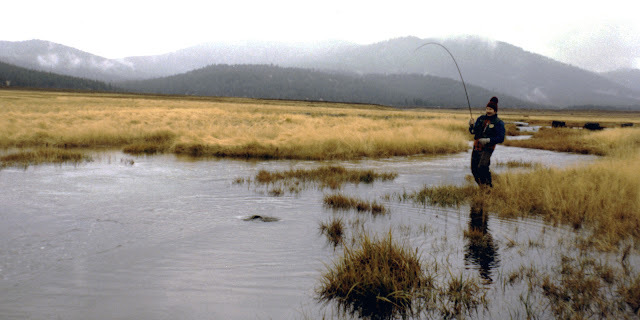 Liberty Lake drains south into Favre Lake, and Favre Lake drains west into Kleckner Creek, and Kleckner is but one of numerous creeks draining the western slope of the Rubies into the south fork of the Humboldt River. The Humboldt is the longest river located entirely within the state of Nevada; it flows for 330 miles from the East Humboldt/Ruby Mountain Ranges in Elko County and drains into the Humboldt Sink, about 50 miles northeast of Reno, NV. 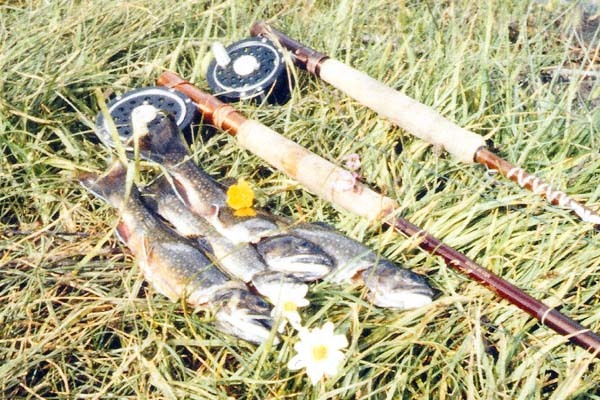 Lamoille Creek had both rainbow and brook trout, and Kleckner supposedly had cutthroat and brook trout (I've never verified those claims). Our trip occurred in early July. I had recently begun dating Denise, my high school sweetheart. I was excited about this backpack trip but melancholic about being away from her for so long after having just been reunited. Bergie, on the other hand, was to leave the Rubies for Sacramento where he had fallen in love with Kathy Duren, his high school sweetheart. How fortuitous that we both fell in love with our childhood sweethearts at the same time, eventually marrying them within a year of each other. Thirty-eight years later we're still married... and to the same women. This is more a testament to our wives' patience, perseverance, and resourcefulness than anything Bill or I can lay claim to. with Castle Lake in background and Favre Lake nestled between them. We donned our 70-pound packs and headed up the pass. Our packs were heavier than normal because we brought along a 160-foot climbing rope, climbing hardware, climbing shoes, and of course our fishing gear. We undoubtedly over packed. The trailhead starts in Lamoille Canyon heading south; in other words, we were on the north side of the pass. Once we passed Lamoille Lake at 9,750 feet we realized what that geography meant: no visible trail as there was still spring snow-pack all over the north-facing slopes. One would think that the snow would be minimized by mid-July, but not in the Rubies that year. We had both driven about 400 miles, so we were not about to turn back. Rather, we pushed on through the snow trying to make our way to what we believed was the pass. Once we attained the summit we were relieved to see the south side of the pass fully into spring bloom. It was reassuring to see flowers and green fields of grass. We descended to Favre Lake and set up camp just above the lake. That afternoon found the brookies to be so voracious they took anything we presented. We saw no other hikers on that side of the pass, so I assume we might have been the first anglers of the season. The brookies were in the eight to ten inch range, but I did catch one at the outlet into Kleckner Creek that approached twelve inches... okay, perhaps closer to eleven. We kept four for dinner that night, but we released dozens of trout. We salt and peppered the trout and stuffed them with wild onions (scallions) that we plucked on the way back up the hill. We wrapped them in aluminum foil and covered them with hot coals. They were the best tasting trout I have ever eaten, similar to shrimp. I have never tasted anything like them since (which is a very sad statement to confess). Bill and I did manage to put some climbing gear to use by bouldering one or two "very large" boulders using a top-rope. But my heart wasn't into the climbing. I was likely anxious to get home to Denise. FisherDad descending Liberty Pass with an 70-lb pack. 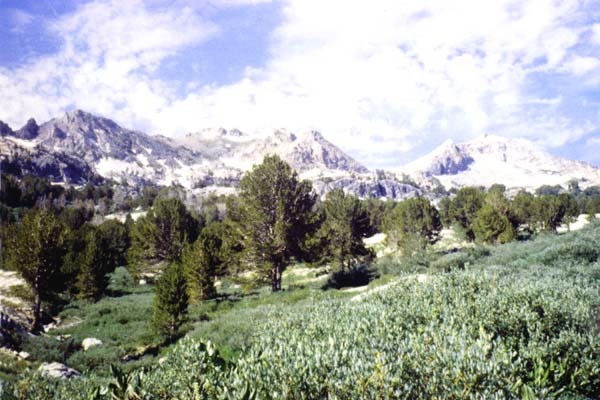 For other Ruby Mountain related stories, visit these other two blogs: Northeastern Nevada - Ruby Lakes, Lamoille Creek, & Illipah Reservoir and Elko County Waters: Ruby Marshes, South Fork Reservoir, and Wild Horse Reservoir. Lake Peak aglow to the south, just above Liberty Lake. FisherDad just above Kleckner Creek outlet. Bill just above Kleckner Creek outlet. Bill snapped the picture just as I struck a Brookie taking a dry on Favre Lake. Liberty Lake lies above and to he left of this picture. FisherDad being top-roped up a granite boulder by Bill Bergan. A jeweled little alpine Brook Trout; a New England transplant just like FisherDad. 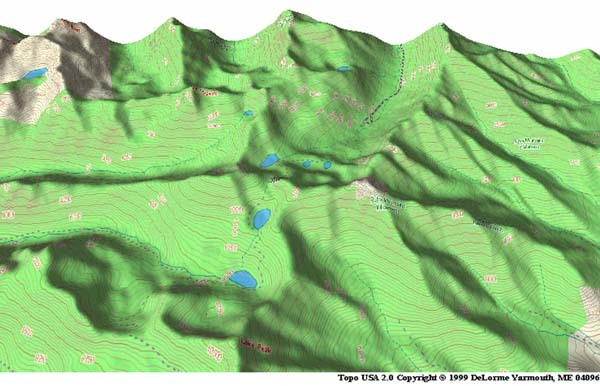 Above is a 3-D topographic map of the area just south of Lamoille Canyon. is not pictured on the map, but would be on the ledge south of Favre Lake.